The whole family is invited to join in our campfires, for lots of old fashioned fun. 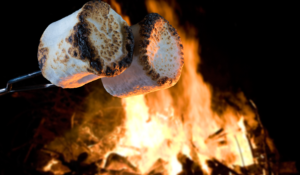 You’ll hear campfire stories, may meet some animal guests, play games, sing songs and, of course, enjoy S’mores! Each campfire has a nature theme and promises to entertain. Please note, campfires will not be held in inclement weather. If the weather is uncertain, contact the appropriate nature center. Register children and adults; children must be accompanied by a registered adult. All Spring Campfires are $5 per person. Sat., March 16, 7 – 8 p.m. Sat., March 23, 7 – 8 p.m. Sat., April 13, 7 – 8 p.m. Sat., May 4, 7 – 8 p.m. Sat., May 25, 7 – 8 p.m.
Fri., March 8, 6 – 7 p.m. Sun., March 17, 5 – 6 p.m.
Fri., March 29, 7 – 8 p.m. Sat., April 20, 7 – 8 p.m.
Fri., April 26, 7 – 8 p.m. Sat., May 11, 7 – 8 p.m.